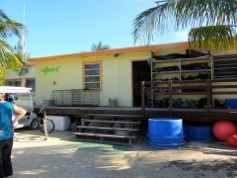 On Saturday we toured the Bimini Biological Field Station Shark Lab in South Bimini. We visited the lab three years ago, but it was so interesting we wanted to go again. 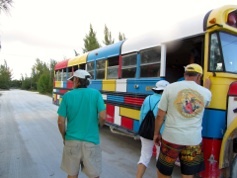 A group of us boarded the free bus at Bimini Sands and rode the short distance to their facility. Michael, the Shark Lab manager, greeted us and brought us into a room that serves as a storage area for project materials and their classroom. He talked about the lab and what they do there for an hour. Basically, they study sharks in Bimini. One ongoing project involves putting tracking devices on the “juvenile” lemon and nurse sharks. They catch them in the mangroves of North Bimini by waiting until the tide goes out and the sharks retreat to a deeper channel with a narrow opening. Then they place a net across the opening and catch the sharks as they exit. After attaching the tracking device near their rear fin, they return them to the mangroves. Five days later, after watching the sharks’ movements, they have to catch the sharks again to remove the expensive tracking devices. For longer studies they can surgically implant tracking devices. Sharks are born in the mangroves here and stay until they become adults. However, the females return to Bimini to these same mangroves every two years to give birth. The marine biologists know this because they put tracking devices on them. 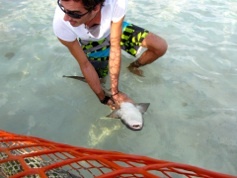 The Shark Lab is in South Bimini and the sharks are caught and released in the mangroves of North Bimini. In between is the ocean, where big sharks live. Big sharks and other predators eat little sharks, therefore the staff takes the juveniles back in a boat to release them near their homes. This is a relatively short, but dangerous, distance. In 2012 they captured and released 543 sharks from 11 different species. All of the workers at the Shark Lab start off as volunteers and eventually are hired as paid staff or come back to do projects. 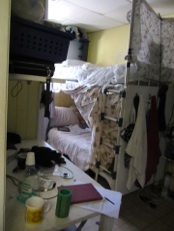 Their building is a double wide trailer and as can be seen in the photo on the right, their sleeping quarters are reminiscent of college dorms. 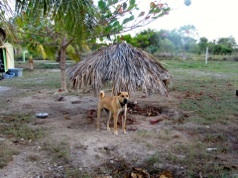 The staff are all in their mid to late 20’s, thus they don’t really mind the rustic conditions. The staff varies throughout the year as scientists come and go from various countries. 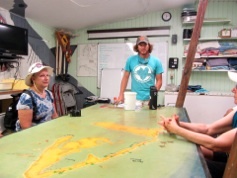 Doctoral marine biologist students come to the lab to get data for their research. Currently three doctoral students, called Principal Investigators, are performing experiments with the local sharks. Their three topics are: “Personality in Large Marine Vertebrates,” “Daily Energy Budget of Juvenile Lemon and Nurse Sharks,” and ”Day in the Life of a Shark.” The last study is Robert Bullock’s, who is in the photo at the left and is from Great Britain. It is a complicated study involving tracking the sharks after he implants tracking devices and observing their various activities throughout the day. 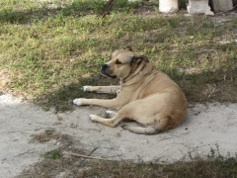 To do this he first observes them in a pen so he can interpret the information he retrieves when they move. He told us he gave it this simple name to attract the attention of grant providers. After we had the presentation in the building, we walked to the beach and waded out to the shark pen. (In the photo we are returning to shore.) Normally, there are more juvenile sharks in the pen, but they released them all when the staff went home for the holidays. This week there was only one little nurse shark in the pen. Robert caught it and then turned it on its belly. This causes the shark to become almost comatose. We were told that most sharks are afraid of humans. The last time we visited the lab, I asked what they recommended we do if we see a shark while we are in the water. The answer was, “Enjoy the experience.” Personally, I would enjoy it quickly. 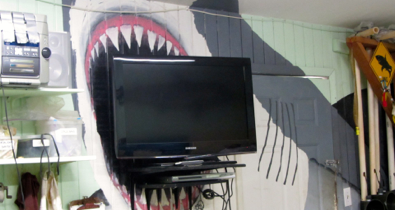 The Shark Lab has many famous visitors and a number of documentaries have been filmed at their facility. One visitor was Wendy Benchley. Yes, that name is familiar. She is the wife of Peter Benchley, author of Jaws. We were told that after he realized the fear of sharks his book and the movie caused, he became a marine conservationist. Googling his name, I came across this fantastic website, Peter Benchley, Jaws Author, Ocean Advocate. It’s worth looking at the site just to view the photos. 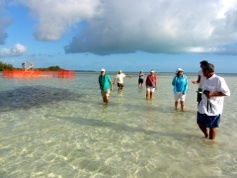 In 2012, the Shark Lab had five different week long Marine and Shark Biology classes with students from U.S. colleges. One of the classes involves students scouring the island for various marine and land inhabitants, bringing them back to the lab, placing them in aquariums and studying them. 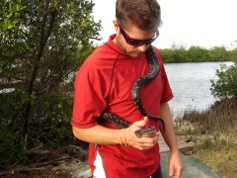 The snake pictured on the left is the Bimini Boa, one of many species of snakes on the island. Other activities when students come are conservation discussions and snorkeling with sharks as well as being involved in the ongoing projects at the lab. The Shark Lab’s website has more information about their work.